Updates to Malcolm's profile since your last visit are highlighted in yellow. DHS, Australian Institute of Management (AIM), and the University of Sink or Swim. I don't have a degree, and when I arrived in Aus for my new position, I discovered that most of my staff were Chemistry graduates, so I had to learn fast, and could soon hold my own in our field. I discovered that desperation is a good substitute for education. The opportunities and the rewards for hard work, in Australia, are so good that my wife (an ex-school teacher, graduated from Teacher's college in Queen Mary Avenue) and I retired very comfortably in 2005. After living on 25 acres in Victorian State forest and surviving bushfires for 10 years, we are now living in SA Riverland, on the Mighty Murray. Boating, fishing, socialising, vintage motoring and thoroughly enjoying life. Very little to tell. I was a funny skinny nerdy little fellow. Isaak van Heerden once said to me "Tubb by name, but not by nature" He would not say that now. I have been grazing in a good paddock since. What else have you been up to since 1963? Emigrated to Australia, and enjoyed the great opportunities on offer. Malcolm Tubb has a birthday today. Malcolm Tubb added a photo to his profile gallery. Malcolm Tubb changed his profile picture. Malcolm Tubb updated his profile. View. Malcolm Tubb posted a message. 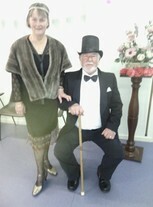 Us, scrubbed up for a photo on a Vintage Car Club rally. We have a 1938 Morris 8, which causes great annoyance to the truckies on the highway, so we have a 1970 Beetle, which doesn't hold them up nearly as much. Our 1961 Vespa doesn't venture out of Renmark because it doesn't do hills. Malcolm Tubb has left an In Memory comment for Michael Geoffrey Peacock. Michael lived one street up from us in Bellair. We were good mates pre-school, through Bellair Primary School and then at DHS. On JC swot leave we were picking guavas in a tree in his backyard. The branch we were on broke, and we both fell (maybe 2 metres). Michael was complaining of a pain in his side, so the doctor was called, but could not diagnose a problem, and he went to lie down. I visited him later that evening and he was still in pain. The following morning I got the awful news that he had died. There was no trauma counselling back in those days, and as a young teenager, it took me a long time to get over it. His family never did. Malcolm Tubb has left an In Memory comment for Arne Hobel-Nielsen. Arne was, like me, a bit of a low profile nonentity at DHS. We were great mates, and he often invited John Jackson and me around to their flat close to school for lunch, coffee and a sly cigarette. Our friendship continued after school, and we had some great parties on board the Safdan Yvonne, where Arne was a Deck Officer. After he moved back to Stockholm in the early 70's we kept in touch with Christmas cards every year, until 1998, when I did not get a reply. A little later I received a letter saying "you do not know me. I am Ingrid, Arne's daughter. I must tell you, that my father's heart stopped. We are very sad." So was I. The year previous I had had a business trip to Malmo in Sweden, and had planned a brief side trip to Stockholm, but bad weather prevented it. Another regret.